Both sides of the story… | Graham.Creative. « Fruit. The “new” taboo. There’s a post on Facebook doing the rounds about Dolphin bludgeoning in Denmark. Before you judge it, it’s worth knowing a few things. See the whole story, and both sides. 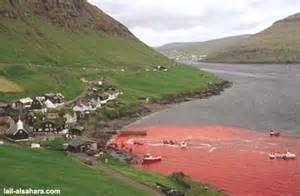 Firstly it’s the Faroe Islands. A land with no farming at all. No crops. No dairy. Secondly they’re not endangered Dolphins. They’re wide spread pilot whales. Thirdly they are never hunted. Only killed when they’re in the bay once a year. And it’s an ancient ritual, not a coming of age for teens. And it’s a ritual for food. For them. Never for sale. They know and will probably stop this practice some day too. But understand that It’s an essential part of a fiercely independent island’s heritage, not a shameful wasteful blood sport. Wouldn’t it be better if high-profile marine campaigns left the Faroese alone and focused on the more immediate and pressing threats to ocean ecosystems? • Only this week a factory was discovered in Pu Qi in China that is processing more than 600 whale sharks a year. • The world’s largest fish, a harmless plankton feeder, is known to be dwindling fast across the tropics. • In the Mediterranean, a combination of vested interests (some criminal) and lax European Union laws have resulted in the decimation of tuna populations. • In the St Lawrence River in Canada, a small population of beluga whales is being poisoned by PCBs. • Around 100 million sharks of all species are being caught worldwide to feed the Asian market for sharkfin soup. • In many areas, 90 per cent of large carnivorous sharks have been removed from the ecosystem. • In India and Sri Lanka, there is a burgeoning fishery for giant manta ray gills to make ‘blood purifiers’ for the Chinese medicine trade. • Parrotfish and conch are being overfished in the Caribbean, allowing algae to lay waste to the coral reefs. Find out the real story before judging. Don’t believe everything. Especially on social media, a knee jerk, one sided and judgmental form of media.